Get the f*** out of the way. Jazz musicians taught me how to produce funny cartoons. Seriously. There are a lot of parallels between cartoons and jazz. They’re both distinctively American art forms, incubated towards the beginning of the 20th century, hitting their first artistic and popular peaks towards the end of the 1930s. And they’re both a lot of fun. For me, it’s is a lot more personal. My life in jazz uniquely prepared me for the thrills of being involved in cartoons. My producing career began by making jazz records –it was supposed to be a stepping stone to pop music– which usually prompts quizzical stares from the folks who know I’m now in cartoons. But, spending every weekend of the last three years watching my older son play his clarinet and tenor in the Jazz Standard Youth Orchestra (my longest extended live jazz exposure in 35 years) I’ve had a lot of time to consider why these two experiences have been hand in glove for me. More than two decades on, cartoons (and California) beckoned, and a similar dynamic played itself out. A huge fan as a kid (who wasn’t?) all I had to go on were the emotions the best films had stirred in me. There were no skills or talents in me to speak of. 15 years in television had me making hundreds, thousands, of commercials –many animated– but it wasn’t like I could draw or write (still can’t), I’d no idea how to put together a schedule or budget, no real ability to “produce” fiction films. I fell back on something Rudy Van Gelder, the world’s most important jazz recording engineer, had taught me at our first session in 1976. “Your job is to figure out what you want to hear, and find the people who are good enough to accomplish it.” To the point, I wanted to make cartoons, as opposed to animation, let’s make people laugh. If you want to too, let’s try it together. Jazz or cartoons, for me it comes down to the same stuff. Find talented people who are worth supporting, and get the f*** out of the way. Henry Grimes played with John Coltrane, Miles Davis, Albert Ayler, Charles Mingus, Sonny Rollins, Don Cherry, and Ornette Coleman, each one an acknowledged giant of jazz. Then, at the age of 31, he stopped playing music, and disappeared. In 1984 Cadence magazine reported the vibrant bassist had died, an early end to a brilliant career. Thing is, Grimes wasn’t dead. My friend Nick Moy pointed out this Washington Post obituary on jazz pianist Hank Jones. Partly because of the two records I produced in the 70s when Nick and I were roommates, but mainly because there were very few talents like Hank. 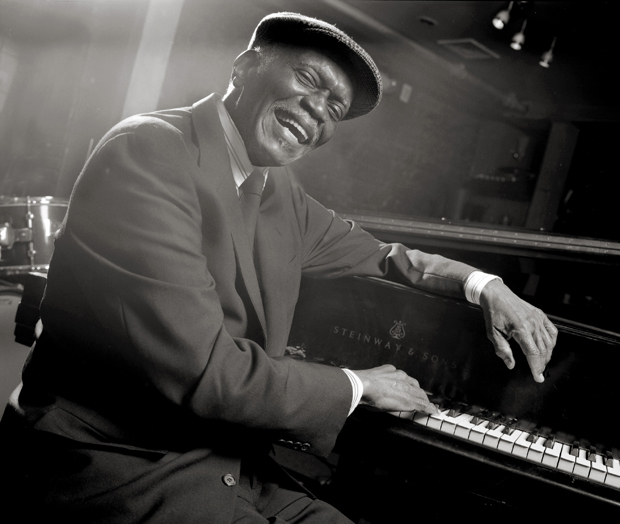 It must be said that Hank Jones being “produced” by a white kid from the New York suburbs is a complete overstatement, but it was an experience I’ll never forget. As is said about him almost everywhere, Hank was a gentleman to the core, with a soft but purposeful approach to life, which translated into his persuasive musicianship. A few hours spent with him translated into deep life lessons on many fronts. Check out this half hour radio show, Piano Jazz Session on NPR’s Marian McPartland’s Piano Jazz, and you’ll not only get a taste of some great piano, but of a real man in a tough business.